Tocaya lands at the intersection of Sunset and Seward, in an older brick space that’s still filled with original details. There’s the pulled-back ceiling showing off the old wooden beams, the big and the arched windows facing out to the street while pouring light back into the space. Inside, expect plenty of greenery, teal and gold touches, and Instagram-worthy signage of course (this one reads: Let Them Eat Tacos, which might be a little on the nose). As for the food, this Tocaya carries the same organic Mexican menu as before, with everyday options ranging from tacos and burritos to bowls and salads, all available to dine-in or for takeout. There’s also a sizable bar and lounge area inside the 5,000 square foot space, doing margaritas and more. 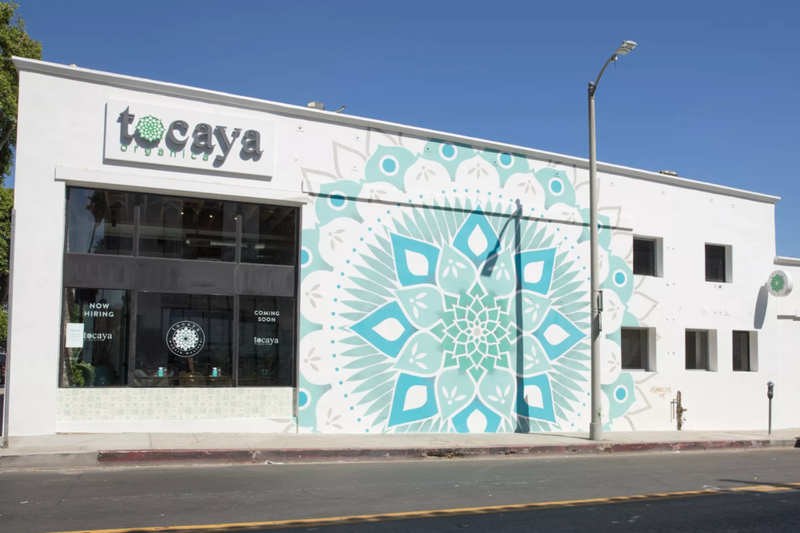 Hollywood diners can find this new Tocaya right across Seward from upscale Curtis Stone spot Gwen, and next door to Hearth & Hound along Sunset Boulevard. The official opening date is August 31, and hours run daily from 11 a.m. to 11 p.m.
Tocaya Organica. 6550 Sunset Blvd., Los Angeles, CA.